Our mission is to provide concierge-level retirement plan services to BOTH employers and employees to help them develop a more comprehensive retirement plan. We help employers evaluate their plan design, benchmark fees, implement a prudent fiduciary process, increase participation rates, and manage overall fiduciary liability. For employees, we maintain regular communications, create budgeting strategies, schedule individual meetings, provide general investment guidance, and develop customized investment strategies to help them retire on their own terms. Our commitment to this service model is to increase the health of each retirement plan we service and to make a positive impact on the lives of the employees involved in them. Give us an opportunity to show you the differences of working with the ARK Wealth Advisory Group at Stifel. Click the links below to learn more about the areas of our Concierge-Level Retirement Plan Services. We help employers manage all aspects of their retirement plan. It starts with understanding the needs and concerns you have with operating your retirement plan. The ARK Wealth Advisory Group evaluates the design of your plan, the services you receive, the fiduciary responsibilities/liabilities you have, and the “reasonableness” of fees paid. Our service model is an ongoing process to help ensure that your retirement plan is an effective one. Sponsoring a 401(k) plan is more than just time consuming, it's complicated. 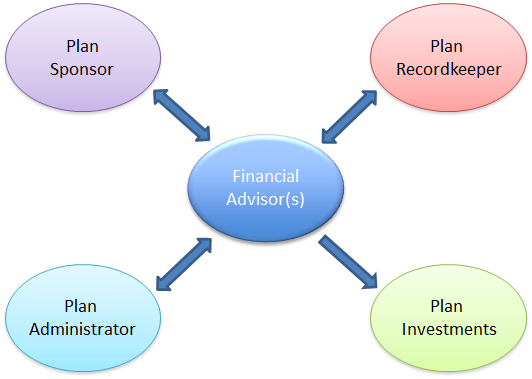 The diagram illustrates the different service providers that are typically involved in a retirement plan. Our primary role is to oversee the entire plan to ensure that it is operating efficiently and effectively. We do this by focusing on both the EMPLOYER and EMPLOYEE and providing them the services they expect to receive. Whether you currently have a plan or are looking to start one, the ARK Wealth Advisory Group can help provide the experience and guidance that makes a positive difference for your retirement plan. The ARK Wealth Advisory Group is dedicated to your retirement plan and helping you meet your fiduciary responsibilities. If this feels familiar, you may have indirectly neglected your fiduciary responsibilities as an employer. There are too many things that make up your fiduciary responsibilities, such as paying fees that are only “reasonable,” selecting a suitable investment lineup, monitoring the different service providers, etc. Our experience and knowledge will help you better manage your fiduciary responsibilities so that you can focus on the other aspects of your business. Tax laws are complex and subject to change. Stifel does not provide tax or legal advice. Individuals are encouraged to consult with their tax and legal advisors regarding any potential tax, ERISA, and related consequences of any retirement plan or account. * This example is intended solely as an illustration of how fee flows may work in one type of 401(k) plan. Every plan is different and should be evaluated based on its specific vendors and structure. Let the ARK Wealth Advisory Group provide a no-cost fee benchmarking report for your retirement plan. Cost matters but so does the value you receive. The 401(k) industry has been moving toward a higher level of fee transparency. The above diagram illustrates how fee flows may work in a typical 401(k) plan. A low-cost plan does not necessarily equal the best plan for your employees. The Department of Labor states that fees must be “reasonable” rather than “low,” but how can employers determine if fees are “reasonable?” They must examine which services are rendered in order to determine the “value” received from the different service providers of their plan. The ARK Wealth Advisory Group can help you compare your fees, define their “reasonableness,” and provide you with a high level of service to ensure that you (and your employees) receive value for the fees that you pay. •Open lines of communications. You can contact us for any question or concerns you have. We will respond promptly to your call or e-mail. •Creating minutes. We will help you take minutes to document the decisions that have been made, and the transactions that have occurred in your plan. •Problem-solving. We will help you trouble shoot day-to-day issues that arise. •Regulation updates. We provide periodic updates on ERISA regulations and the general retirement plan landscape. •Act as your advocate between your different service providers. We work together with the other service providers to make sure your plan is operating efficiently. •Open lines of communications. Your employees can contact us for any investment question or concerns they have. We will respond promptly to their call or e-mail. •Individual meetings. Participants can schedule one-on-one meetings to discuss their personal financial concerns. •General investment education / guidance. We explain the basics of investing, diversification, risk management, and how they all work in a simplified manner. •Budgeting. We help clients identify all their expenses, and create a manageable budget to encourage more savings for retirement. A husband and wife, owners of a local construction company, have an existing 401(k) profit sharing plan. It has been 7 years since they've started the retirement plan. The advisor associated with their plan has not been in contact with them for the last two years. Last year, the wife was notified about the new fee disclosure regulations. She called the plan advisor, and discovered that he was no longer working there. The wife tried to understand what was needed to comply with these fee disclosure regulations, but didn't have time as the company was involved in several important projects. She decided to get help, and found the ARK Wealth Advisory Group. To help get their plan back on track, we started by requesting proposals from different service providers. After assisting the owners with choosing the appropriate service providers, we helped to facilitate the transfer of assets and documentation to the new recordkeeper and plan administrator. Next, we instructed the owners to increase their fidelity bond coverage to at least the required minimum amount. Then we developed a fiduciary audit file and a quarterly service model roadmap for their plan. Finally, we've provided ongoing retirement plan services to help ensure that their plan was operating at an optimal level for both the owners and employees. Whether you're in a similar situation, seeking help to improve the overall services provided in your plan, or just want a different perspective from a financial advisor who has attained the Certified 401(k) Professional™ designation we encourage you to give us an opportunity to show you the difference of working with The ARK Wealth Advisory Group. Our mission is to provide comprehensive wealth management services to successful individuals, families, and business owners that can help them retire comfortably and ease fears of financial uncertainty. To learn more about our Comprehensive Wealth Management services, click here. The case study presented is provided for illustrative purposes only. Past performance is no guarantee of future results. The information has been obtained from sources we believe to be reliable, but we cannot guarantee its accuracy or completeness. These strategies do not guarantee a profit or protect against loss and may not be suitable for all investors. Each customer's specific situation, goals, and results, may differ. Stifel does not offer legal or tax advice. You should consult with your legal and tax advisors regarding your particular situation.